Sunday Night Dance parties at Dance Boulevard in San Jose. See Location. Lesson time 7 - 8 pm. Dance Party 8 to 10 pm. These lessons will be beginning level. Cost still only $10.00. No dance partner is ever required! Performance Nights, Dance and Talent Extravaganza or D.A.T.E. A Performance night (usually referred to as a Showcase) is where the students are the stars of the show. The evening usually starts off with Bud's performance formation team followed by a variety of solo routines, and will end with either a professional show or Bud's competition formation team. For those unfamiliar with the terminology, a formation team usually consists of 2 or more couples dancing to the same routine. In a formation, the couples will either change formation or partners as designated by the choreography. Different circumstances will determine the complexity of the routine. A solo routine is usually comprised of one couple on the dance floor and they will perform a dance specifically choreographed to the music. 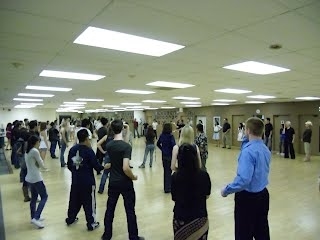 There are three categories for couples Pro/Am (Professional/Amateur) where a teacher dances with his or her student. Professional or "pro" for short, is where both performers are professionals and finally Amateur where both participants are "students". You will see all these combinations at our showcase. Our next performance date is TBD in April at the San Jose Woman's Club at 75 Eleventh Street San Jose. Showtime will start promptly at 8:30, no lesson is being taught for this evening, leaving you lots of time for the show, dancing & eating. No partner ever required. The students will have all been working hard on their routines, you will be SURE to enjoy the show! Check out the Formation Team page if you'd like to learn more. What makes us different from many other showcases? We do not have judges, so the students are free to have fun & perform without any concern for whether or not their steps are perfect, or even if that step is "allowed" for their level. Lifts & tricks can then be incorporated depending on the ability of the student instead of whether or not they have reached the "permitted" level. It is much more interesting and fun for both the student and the audience. What is a dance host? 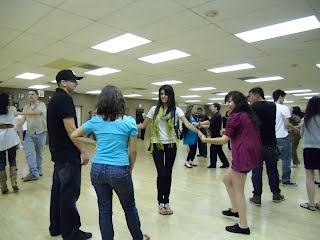 A dance host is someone who is there to make sure you have a wonderful dance experience at our parties. Since not everyone brings a partner we wanted to ensure that you would have someone to dance with. The hosts are also there to provide answers to questions you have about patterns or dances. I have hosts at both our Friday and Sunday dances.